San Diego’s Restaurant Week offers locals an opportunity to enjoy over 180 restaurants in the San Diego area at a reasonable price. This event is eagerly anticipated by many foodies in the region. This year San Diego Restaurant Week is from September 23-30 and offers both lunch and dinner menus. My dinner companion and I had the opportunity to relish the dinner menu for this event at the Red O Taste of Mexico Restaurant in La Jolla. Red O’s culinary director, Rick Bayless, considered the pre-eminent authority on regional Mexican cuisine, has established a menu featuring dishes from Oaxaca, Puebla, and Yucatan, as well as Baja and Tijuana. 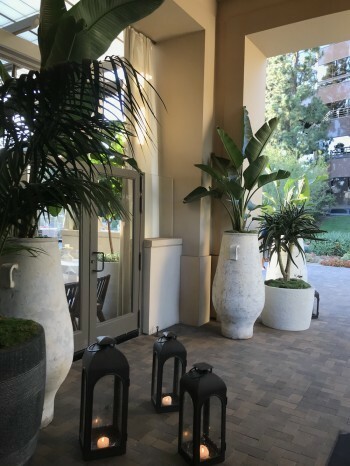 Upon arrival, we noticed the elegant front veranda with a massive outdoor fireplace where private events are held. As you enter through the doors, you see a soaring ceiling inside the indoor-outdoor bar connecting to the outdoor patios with three firepits. There is a modern Moorish resort feel to the interior with massive Moorish-style glass lights on the chandelier. As you walk into the dining room, you pass two arches on either side, one displaying the wines for the restaurant and the other displaying the 200 tequilas available. We were offered a sneak peak of both the lunch and dinner menus for San Diego Restaurant Week. The lunch menu, consisting of three courses, is $20; the dinner menu, also including three courses, is $39 and offers a choice of four entrees. 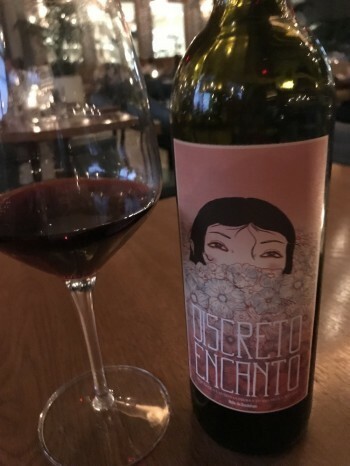 The opportunity to share a bottle of Guadalupe Valley wine from Mexico is rare, and the opportunity arose so my dining companion and I settled on the 2016 Lomita “Discreto Encanto” Tinto, a blend of Shiraz, Barbera, and Tempranillo. Its soft tannins and luscious jammy flavor paired well with the spicy sauces we tried this evening. My dinner companion had dined at Red O in the past and insisted that we try the Butternut Squash Soup, a combination of garlic, cream, mulato chiles, and butternut squash poured over small squares of squash, Marcona almonds, and golden raisins. This soup is sheer bliss! After much deliberation and guidance from our servers, we chose two appetizers to share. 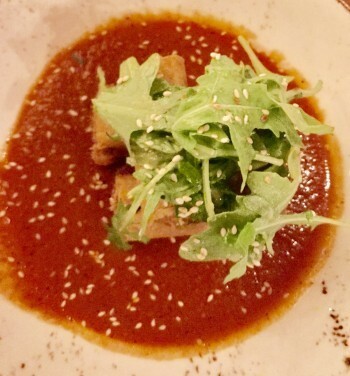 I selected Mary’s Duck Taquitos made of duck leg, and served in a tomato-arbol chile sauce topped with baby arugula. My companion chose the Fresh Corn & Goat Cheese Tamales—fresh ground corn masa steamed in corn husks and covered with a tomatillo salsa. That delightful course of appetizers was followed by two delectable entrées. 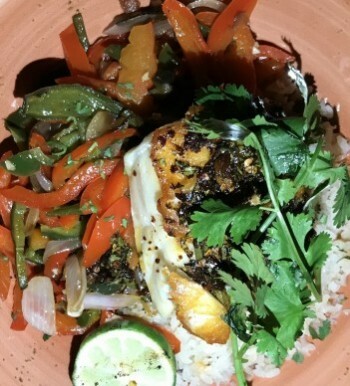 Since Sea Bass is such a treat, we selected the Pescado Del Dia (Fish of the Day) which was grilled Sea Bass served with white rice and covered with a Guajillo (chile) Chimichurri. The Sea Bass was perfectly cooked, and the Chimichurri added a nice zest to the dish (photo below). The other dish we selected was the Baja Shrimp Scampi consisting of scampi floating on a sauce of stewed tomatoes and garlic on a bed of Fideos Noodles smothered with a white wine butter sauce. Ah! These two dishes were magnificent! Even though we were stuffed, there was still dessert beckoning us. 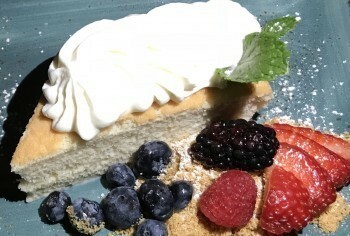 Our server brought us the beautifully presented Tres Leches cake, a delicate cake soaked in three milks and topped with whipped cream and fresh berries (photo below). Red O Taste of Mexico Restaurant is located at 4340 La Jolla Village Drive, La Jolla, CA. The phone number is (858) 291-8160. 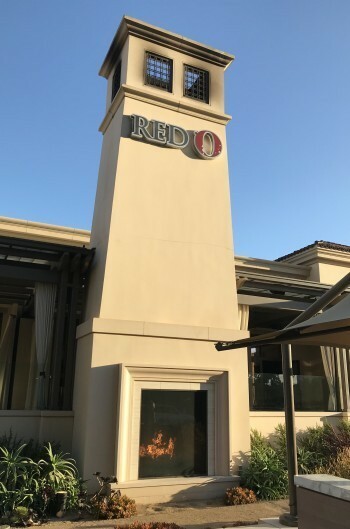 To read more about the restaurant, visit their website at: http://www.redorestaurant.com/. More information on San Diego Restaurant Week can be found at: https://www.sandiegorestaurantweek.com/. As is customary in this industry, we were hosted at Red O Restaurant, but my comments express the delightful dining experience we had.